The FIDEA group conducts crossdisciplinary environmental research from both theoretical and empirical point of view. We gather specialist knowledge, integrate it, and invite the experts to share their thoughts with people from other fields of environmental expertise. Read more about FIDEA group. The FIDEA group builds on but is not limited to a collaboration of researchers from three organizations – Department of Environmental Sciences at University of Helsinki, Finland Futures Research Centre at University of Turku and Environmental Policy Centre at Finnish Environment Institute. Read more about FIDEA researchers. Smog in the city, hard to breathe. Is it time to take your asthma medication, buy a hybrid car, refocus driving school curricula, empower public transport users, or draw the government’s attention to new low-emission visions? Good points but who would grasp the big picture? At best, experts from various disciplines may communicate with each other in order to solve environmental problems. But it seems that due to different specialized perspectives interpreters or moderators are needed in the dialogue. The FIDEA group is interested in this challenging interdisciplinary endeavour. We are focusing on various real world questions such as traffic, food, climate change, energy and forest biodiversity. Our results are broadly applicable to environmental policy, management, education, and communication. In the CAST project, we map past trends of national transport volumes and transport carbon dioxide emissions in 1980-2008 and build scenarios for the future up to 2030. We identify key drivers of transport volume and efficient means for emission reduction by exploring transport experts’ views. In addition, as the mass media plays a key role in formulation of environmental policies, we look at how the climate and transport questions are discussed in newspapers. The cases studied in the CAST project are the carbon dioxide emission based car tax reform in Finland that was launched 2008 and the EU Energy and Climate Change Package launched in 2009. Three questions are addressed (see the Table below). To answer the first question we perform an analysis of national statistics for 2008-2010. The future development is addressed via a two-rounded Delphi study, where expert and interest group views of the future development up to 2020 are gathered and analysed. The second question is answered through the Delphi study and a content analysis of the discussion in the news cycle of mass media. The third question is under scrutiny in the Delphi and media studies, as well. We analyze the interview and newspaper data by using the Environmental Protection Process (EPP)-model[LINKKI], which is one of the key conceptual products of broad interdisciplinarity made by the FIDEA group. The quantitative data is analysed via cluster analysis that groups similar expert views on the future. 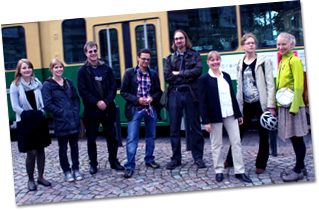 Project name: The climate discussion of transport (CAST) – An interdisciplinary environmental analysis. Funding from: Academy of Finland. Project durance: 2009-2012. Researchers: Katri Huutoniemi, Laura Joki, Jari Lyytimäki, Nina Nygrén, Petri Tapio, Vilja Varho. Lyytimäki, J. & Tapio, P. 2009. Climate change as reported in the press of Finland: From screaming headlines to penetrating background noise. International Journal of Environmental Studies 66(6): 723-735. Tapio, P., Huutoniemi, K., Lyytimäki, J., Varho, V., Willamo, R. 2009. An Inter- and Transdisciplinary Analysis of the Climate Discussion of Transport. Paper presented at the conference Towards Knowledge Democracy, University of Leiden, the Netherlands, August 26, 2009. The Environmental Protection Process (EPP) model is a qualitative system model developed for broad interdisciplinary environmental research and education. There are several versions of the model. The following version has been published in the journal Ambio. Here, we demonstrate the use of the model by using transport examples. The topic under study, transport, is a form of human action. It is affected by various societal, individual and ecological factors. Also transport infrastructure, such as road, rail and bicycle networks, plays an important role. Any human action requires intakes from the ecological environment, such as crude oil, and releases outputs to the ecological environment, such as carbon dioxide emissions. Intakes and outputs, in turn, change the ecological environment, for example by increasing carbon dioxide concentration in the air. The change typically turns into secondary impacts: due to increased emissions the atmospheric radiative forcing increases and causes climate change. These changes and ecological impacts also have impacts to the human environment, such as increased risks for floods causing damages to buildings. Up to this point of the model, the process has proceeded causally, or ‘automatically’. However, the impacts as such are not automatically perceived as problems but may or may not be defined so by various human actors, such as citizens, politicians, scientists, or media. As can be seen from our media study, these perceived problems change over time. If problems are considered severe enough, the process may result in setting concrete targets, as in the EU climate and energy package launched in 2009, or to less concrete targets as set in the Copenhagen Conference of Parties (CoP15) 2009. In some cases, measures aiming at the problem definition process may mean ignoring the problem or adoption of contrary evidence showing that there is no problem (for example, that the climate is not changing due to human releases of greenhouse gases). Means focusing on the impacts might include improvement of flood control, or geo-engineering by increasing particle concentration in the air. Means focusing at the change might include increased carbon sequestration, which is a process of removing carbon dioxide directly from the air. Means focusing at ecological factors might include changing topography by building tunnels and bridges to reduce energy consumption of transport. Means aiming at the emissions may be carbon capture and storage or low-emission vehicles. Means aiming at human action may be technical (such as a shift to more energy efficient vehicles), or social (mode shift from road to rail). Means aiming at infrastructure affect the everyday conditions of human behaviour, such as increasing the number of railway stations for local trains. Means aiming at individual factors focus on the informational, ethical, emotional as well as experience and resource conditions of individuals, such as information campaigns, advertisements etc. Means aiming at societal factors focus on changes in policies, administration, legislation, economy, religion, science, education, mass media and, social activism. 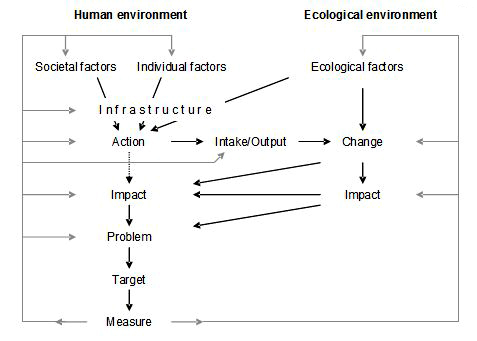 Tapio, P. & Willamo, R. (2008) Developing interdisciplinary environmental frameworks. Ambio – A Journal of the Human Environment 37(2): 125-133.